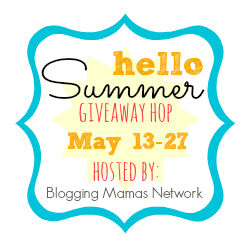 Welcome to the Hello Summer Giveaway Hop hosted by the Blogging Mamas Network. The days are getting longer and hotter and we’re saying Hello to Summer in fun giveaway style! Beat the heat and hop around to all the participating bloggers’ giveaways at the bottom of this post. And don’t miss out on the fabulous Summer Vacation Savings Account Grand Prize sponsored by Outski! I’m not sure I remembered the secret code or not . I entered , if I’m wrong, I’m sorry. I don’t save e-mails. I guess I need to start a notebook with your secret code. It’s hard to remember. Thanks for this giveaway. Wow! Would I recieved a Kitchenaid mixer for Christmas~ how awesome to win an attachment for it!!! Wow! I recieved a Kitchenaid mixer for Christmas~ how awesome to win an attachment for it!!! I have wanted attachments for my KitchenAid ever since I got mine ,this would be so great . Thanks for chance to win. Holy Great Grinder, Batman! I want this SO much! I want to make 50/50 burgers – half ground beef and half ground bacon and I desperately need this to grind the bacon! Please, please, pick me!! Love the newsletters! Thank you for brightening a rainy May day. Have had a KitchenAid mixer for many years, but don’t have any attachments–would love this one! This would be great for making sausage and burger. This looks nice and fresh and a bit spicy. I might have to give it a try this summer. Home ground meats sound like a great idea! Was just talking to my mom about this attachment yesterday! Would love another reason to use my Kitchen Aid mixer!